There’s nothing like a funny meat quote. There is no meat in my eggplant caponata and I’m sorry to disappoint you, I don’t have a funny meat quote either. But I have a good recipe for all who despise the meat and all who are embarking on a Lenten journey. 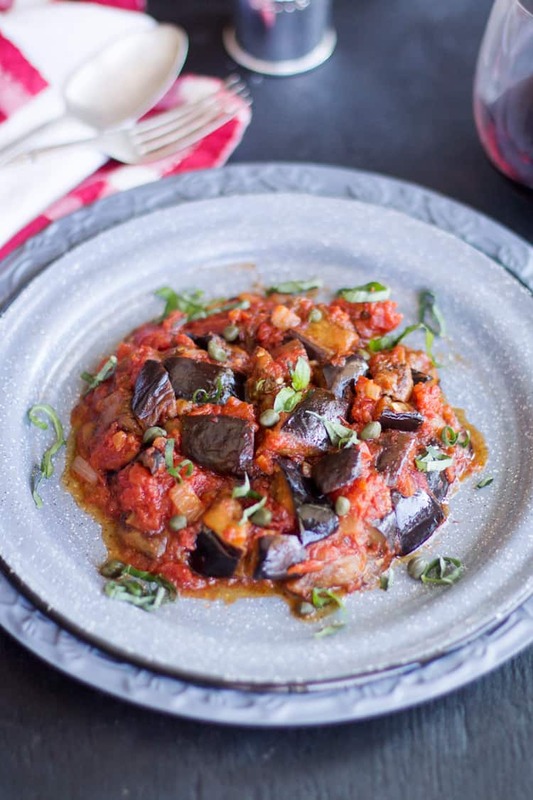 In Sicily caponata is a popular, picturesque and refreshing summer dish of eggplants and tomatoes a.k.a. “taste of Sicilian passionate kiss of the sun”. 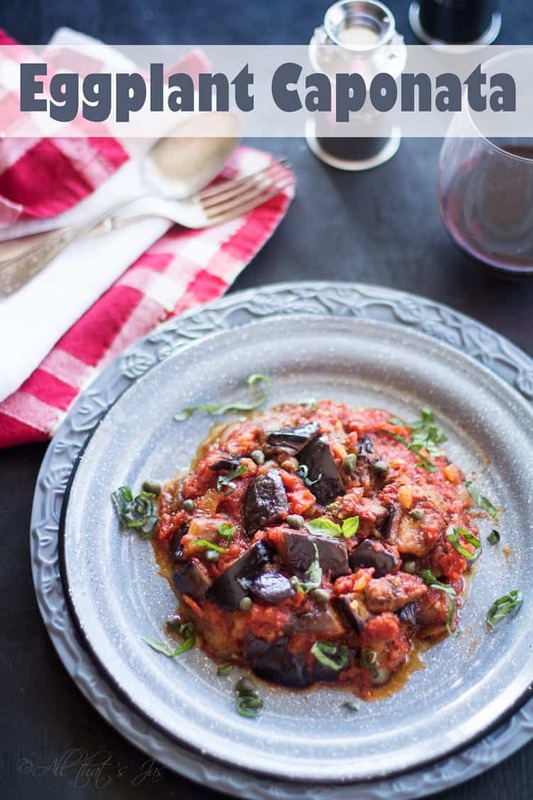 With caponata, I’m bringing Sicily home and hoping the sun will tag along, but served warm alongside mashed potatoes or pasta I find it nourishing enough even for cold days. I love how versatile this dish is: serve with crusty bread for a hearty appetizer, warm or cold, as a side dish or vegetarian main dish. The spiciness is perfectly paired up with sweetness and nuttiness of the eggplant. Clean and dice eggplant, but do not peel. Sprinkle lightly with salt and set aside for 30 minutes to draw out the moisture. In a saucepan sauté onions until softened. Add diced tomatoes with juices and cook until it thickens. Meanwhile, rinse eggplant with hot water (removes bitterness) and pat dry with paper towels. In a large skillet over high heat, heat the olive and vegetable oil. Quickly fry the eggplant pieces until browned. Add the chopped celery and fry tree more minutes. Pour in the tomato sauce, olives, capers and salt to taste. Mix well and sauté for five minutes. Add sugar, vinegar, basil and crushed red pepper. Lower heat; simmer for five minutes. Serve. Nourishing Sicilian vegetarian dish of eggplants and tomatoes is a bit spicy with just a right amount of sweet. You don't believe me? Try it! Serve with crusty bread for a hearty appetizer, warm or cold, as a side dish or vegetarian main dish alongside mashed potatoes or pasta. Yumm-o!! We made this last night along with some whitefish, very tasty! Looks delicious and great for those meatless Mondays, etc. I think I would love mine on top of some polenta. Delish.I am sorry I missed Thursdays fun, this week went by so fast I completely forgot. Will try to hook up on Thursday this upcoming week. Sharing of course! Wow! Such a lovely dish! I wish to give your recipe a try! I LOVE eggplant caponata!!! I like to eat it as a sandwich with some asiago cheese melted on top! It really is the perfect Lenten dish! Thank you so much for sharing at SYS and have a great weekend!!! Ohhh, cheese! Of course! Why didn’t I think of that? Thanks, Barbara! Thanks for linking up with Waiting on…Wednesday @ While I’m Waiting! Looks delicious! I’ve never made caponata, will have to give this a try and will definitely include the capers and green olives, yum. Thanks for sharing at What’d You Do This Weekend? I hope you will join us again this Monday! It really tastes better than it looks, lol. Yes, it does! Thanks for stopping by! This sounds pretty good. A good time to try eggplant. Thank you for linking up to Party Time and we hope to see you again next week! All I can say is “YUM!” I looooooove eggplant!